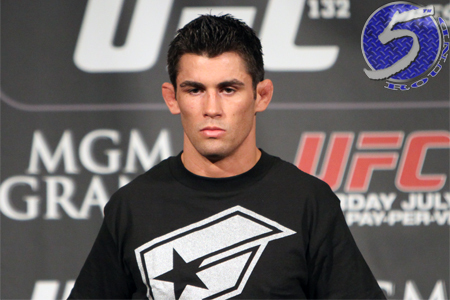 Former UFC bantamweight champion Dominick Cruz (pictured) will finally end his injury-plagued 35-month hiatus … fingers crossed. On Tuesday night, it was announced Cruz will meet Takeya Mizugaki at UFC 178. The 28-year-old was set to unify the title against then-interim champ Renan Barao at UFC 169. However, Cruz was forced to pull out of February’s bout after tearing his groin. He was immediately stripped of his belt and Barao was donned the division’s outright king. Barao later lost his crown to TJ Dillashaw at UFC 173, but will get an immediate rematch next month at UFC 177. Cruz owns a dominant 19-1 professional record. The lone blemish on his résumé came in a submission loss to Faber back in March of 2007. Mizugaki, meanwhile, will be riding a five-fight winning streak into the tango. All of those wins have come via decision, with his most recent against Francisco Rivera in May. UFC 178 takes place September 27 at a yet-to-be announced location in Las Vegas, Nevada.